The teak deck should be part of your boats character. However after a few weeks the teak will turn greyish. A smooth silvery grey deck is probably what most people like to see but the reality is often something quite different! For some years we have had enquiries for Boracol 10Rh from yacht owners across the world, especially from Hallberg Rassy owners with teak decks. They’ve said that HR recommend Boracol 10Rh for controlling moulds on teak decks and algae and those who’ve used it say it works splendidly, with some treatments lasting 1-2 years. It is obvious that all kind of boats with teak decks, could take advantage of a treatment with Boracol if they have the above problem. It is recommended not to use acid cleaners, hard brushes or pressure washers on teak decks. The deck should only be cleaned with green soap or a gentle shampoo, using a very soft brush or sponge to spare the soft parts of the wood fibres and seams. Wash across the grain to minimize wear of the teak. As above best way to treat the teak deck against mould and algae is to use Boracol, either 10RH for professional users or 5RH for amateur users. These grades provide very similar performance because both products contain two biocides. The biocide (quaternary ammonium) that controls or deals mainly with the algae and mould is at the same level of activity in both products. The second biocide (inorganic borate) is at a lower level in the Boracol 5Rh, but it doesn’t impair performance as it has no direct action against algae and moulds. The borate works in a synergistic way with the quaternary ammonium and is included because the original use for Boracol was in the control of wet and dry rot in buildings. You may have read, or been told that you need to apply double the quantity of 5Rh compared to 10Rh. This is not the case. Both products can be used at similar application rates with the same results. washing – check first). Allow the surface to dry out until just damp. but not running off). Avoid any run off to other parts and from the boat. Allow the surface to dry out until just damp again. Apply a second coat of Boracol to refusal. Coverages tend to vary somewhat but usage rates are normally 4 to 5 m2/litre. Use a normal paint brush or a sprayer with a flat spray and paint the deck with Boracol. Never use a hard brush on the teak! Do the work on a dry day. If it rains too much, Boracol will be washed away. It does not matter if it is drizzling the next day but if it rains much or if waves splash over the deck, the Boracol will have no effect having been washed off too quickly. If it does not rain, spray the deck with a little water. This little amount of water will help the Boracol penetrate into the teak. After three to seven days you wash the deck with a sponge and cleaner, for example green soap. Please note there is not always a positive result immediately. On the contrary, the deck might look worse than it did before the treatment. After approximately ten days things will start to happen. The algae and mould will disappear leaving the deck clean and will not recur for some time. Do not be afraid to repeat the treatment whenever you feel necessary. Most yachtsmen like to treat their decks with Boracol at the beginning and end of the season. 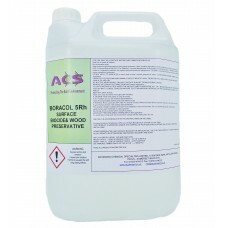 Boracol has no effect on the caulking (rubber) in the teak and also no effect on paint or gelcoat.